These encoders are classified based on the Output signal and sensing technology, the Incremental Encoder and Absolute Encoders are classified based on Output signal and the Magnetic, Optical and Laser Encoder are classified based on Sensing Technology. The Encoder used here is an Incremental type Encoder. The first two pins (Ground and Vcc) is used to power the Encoder, typically +5V supply is used. Apart from rotating the knob in clock wise and anti-clockwise direction, the encoder also has a switch (Active low) which can be pressed by pressing the knob inside. The signal from this switch is obtained through the pin 3 (Switch). Finally it has the two output pins which produce the waveforms as already discussed above. Now let us learn how to interface it with Arduino. The Rotary Encoder has 5 pins in the order shown in the label above. The first two pins are Ground and Vcc which is connected to the Ground and +5V pin of the Arduino. The switch of the encoder is connected to digital pin D10 and is also pulled high though a 1k resistor. The two output pins are connected to D9 and D8 respectively. To display the value of the variable which will be increased or decreased by rotating the Rotary encoder we need a display module. The one used here is commonly available 16*2 Alpha numeric LCD display. We have connected the display to be operated in 4-bit mode and have powered it using the +5V pin of Arduino. The Potentiometer is used to adjust the contrast of the LCD display. If you want to know more about Interfacing LCD display with Arduino follow the link. The complete circuit can be built on top of a breadboard, my looked something like this below once all the connections were done. 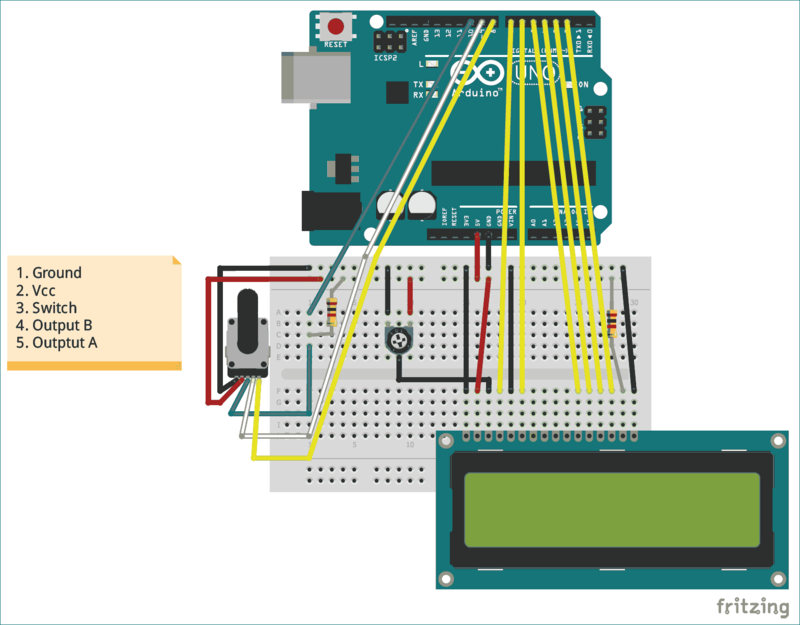 It is fairly easy and straight forward to program the Arduino board for interfacing a Rotary Encoder with it if you had understood the working principle of a Rotary Encoder. We simply have to read the number of pulse to determine how many turns the encoder has made and check which pulse went high first to find in which direction the encoder was rotated. In this tutorial we will display the number that is being increment or decrement on the first row of the LCD and the direction of the Encoder in the second line. The complete program for doing the same can be found at the bottom of this page with a Demonstration Video, it does not require any library. Now, let’s split the program into small chunks to understand the working. 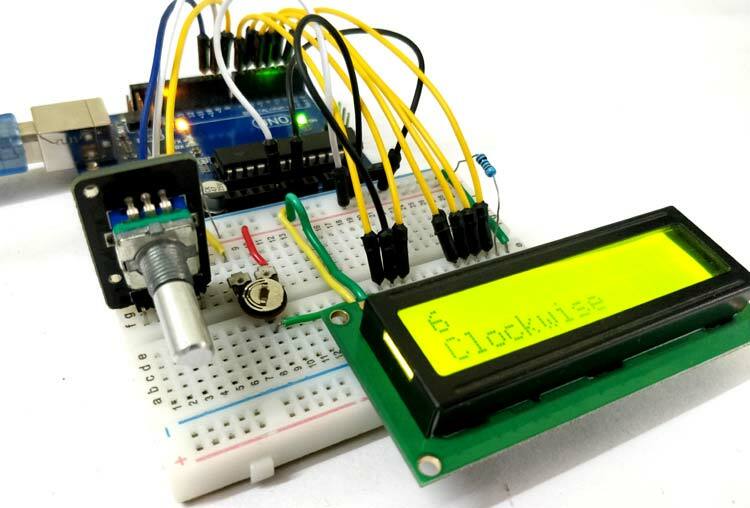 Since we have used an LCD display, we include the Liquid crystal library which is by default present in the Arduino IDE. Then we define pins for connecting LCD with Arduino. Finally we initialise the LCD display on those pins. Next inside the setup function, we display an introductory message on the LCD screen, and then wait for 2 seconds so that that message is user readable. This is to ensure that the LCD is working properly. The Rotary encoder has three output pins which will be an INPUT pins for the Arduino. These three pins are the Switch, Output A and Output B respectively. These are declared as Input using the pinMode function as shown below. Inside the void setup function, we read the status of the output A pin to check the last status of the pin. We will then use this information to compare with the new value to check which pin (Output A or Output B) has gone high. Finally inside the main loop function, we have to compare the value of Output A and Output B with the Previous Output to check which one goes high first. This can be done by simply comparing the value of current output of A and B with the previous output as shown below. In the above code the second if condition gets executed if Output B has changed from the previous output. In that case the value of the encoder variable is incremented and the LCD displays that the encoder is rotated in clockwise direction. Similarly if that if condition fails, in the subsequent else condition we decrement the variable and display that the encoder is rotated in the anticlockwise direction. The code for the same is shown below. Another optional thing is to check if the switch on the Encoder is pressed. This can be monitored by checking the switch pin on the rotary coder. This pin is a active low pin, meaning that it will go low when the button is pressed. If not pressed the pin stays high, we also have used a pull up resistor to make sure the stays high when switch is not pressed thus avoiding floating point condition. Also when the button is pressed, the second line will display that the button is pressed. The complete working can be found in the video below. This is just a sample program to interface the Encoder with Arduino and check if it is working as expected. Once you get here you should be able to use the encoder for any of your projects and program accordingly. Hope you have understood the tutorial and things worked as it is supposed to. If you have any problems use the comment section or the forums for technical help. Neat! Found an encoder (1 of an order of 5) made backwards.